-Fruit (Dry Pulp)- mucilagepection like substance. -Roots and Stem- Tannins, Alkaloids, sterols, coumarin, Aegelin, marmelosine, marmelin, o-methyl hayordinol, alloimperatorin methyl ester, o-isopentanyl hayordinol and linoleic acid. -The leaves are said to cause abortion and sterility in women. It should not be consumed (without a doctor’s consultation) during pregnancy and whilst breast-feeding. 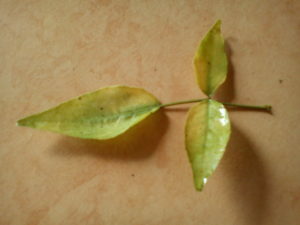 -The bark of the plant is used as a fish poison. -Tannins when consumed excessively, over a prolonged period of time, have an anti nutrient effect and are believed to be carcinogenic. -Excessive bael consumption can lead to upset stomach and constipation.